Croatia is an Eastern European country with a long coastline on the Adriatic Sea. Encompassing more than a thousand islands, it’s also crossed by the Dinaric Alps. Its inland capital, Zagreb, is distinguished by its medieval Gornji Grad (Upper Town) and diverse museums. Croatian Independence Day (Croatian: Dan neovisnosti) is a national public holiday marked yearly on 8 October that celebrates the unanimous decision of the Croatian Parliament – Sabor to terminate the link between Croatia and SFR Yugoslavia. 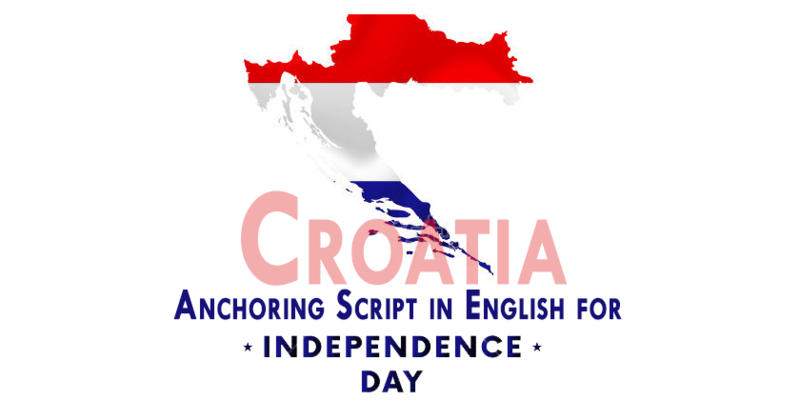 Hence in the article below, I cover anchoring script in English for independence day Croatia. On 8 October, the Sabor decided to end relations with Yugoslavia, in the Decision on the termination of the state and legal ties with other republics and provinces of Yugoslavia. Every year the Croatian celebrate their independence day on 8th of October, this time we came up with 8th October independence day anchoring script for students to host the ceremony at your school and college. Anchor 1: We have all gathered here, for what you call a very fun-filled evening. This evening belongs to all Croatian, the Croatian who have put their heart and soul for our independence and have made this look possible, so I want a big round of applause for our braves, please. Thank you. I (1st anchor name goes here) on behalf of (2nd anchor name goes here) welcome you all to the special evening of splendour. We are glad to have you here with us on this auspicious day when (name of your academy goes here) is celebrating the (number of independence day goes here). You can expect an extravagant and a complete entertainment evening ahead. Ladies and gentleman to pay pride for the people who have sacrificed themselves and made this possible, I request you all to stand up for the Croatian national anthem. Anchor 2: Ladies and gentleman freedom is never dear at any price. It is the breath of life. What would a man no pay for living? Your freedom is brought to your courtesy of the outstanding men and women who serve and have served this country with honour, dedication, pride and sacrifice! At this moment I would like to call on the stage the little fairies to perform a beautiful tableau dance please give them a big hand to be present here. Anchor 1: I hope their talent altered your impression and made you glad. Ladies and gentleman freedom is never more than one generation away from extinction. We didn’t pass it to our children in the bloodstream. It must be fought for, protected, and handed on for them to do the same. Now let’s gear up for another beautiful and awesome exhibition which will be performed by our students. Please, a big round of applause for them to be present here. Anchor 2: Thank you so much, sir. We are really fortunate to have your guidance and support with us. Without you, all this would not have been possible. Anchor 1: We feel honoured to have with us (the name of special guest goes here). Sir, you hardly need any introduction; you have made all of us proud by your distinguished work in numerous capacities. A man of distinct vision and a fountainhead of illuminating ideas. Anchor 2: An idol of knowledge and experience and inspiration to all of us. we welcome you to please come on stage and fulfil our knowledge with your precious thoughts…. Anchor 1: “Those who deny freedom to others deserve it not for themselves.” Abraham Lincoln. DANCE is the most beautiful form of expression of human’s feelings. Dancers are the messengers of God and now we are about to witness some great dances. Some great talent. So let’s gear up for a beautiful start of the show. Ladies and gentleman true independence and freedom can only exist in doing what’s right. And when people have compassion, friendship, and unity, they speak and think in a constructive way to ensure national independence and prosperity. Once again happy independence day to all Croatian. Here I covered Anchoring Script in English for Independence Day Croatia and please feel free to write your suggestion or recommendation in the comment box below.